Some of the earliest healthy-eating advice I can remember—at least when it came to green, leafy vegetables—I received not from my mother, but rather from an unlikely source: Popeye. “I’m strong to the finich, ’cause I eats me spinach,” he used to proclaim, extolling the virtues of spinach as a rich source of vitamins and minerals. Since then, the prevailing winds of “eat these foods because they’re good for you” have blown in many directions: toward tomatoes’ lycopene, blueberries’ antioxidants, and the so-called “superfoods” like pomegranates, acai berries and goji berries that offer myriad health benefits. Lately, though, it seems such advice has come full circle. Greens, including Popeye’s ubiquitous spinach, are back “in” as the new good food. And spring is the best time to enjoy them, whether from your garden, the local farmers’ market, your CSA or the grocery store. Spring’s greens are fresh, tender and young, with bright, crisp flavors and none of the fibrous woodiness that more mature late-season greens contain. Tidbit: Often compared to chicory and endive in flavor, dandelion greens are pleasantly bitter and mildly astringent. They’re a known diuretic used to treat kidney, liver and digestive maladies. This plant’s name comes from the French words “dent de lion” meaning lion’s tooth, referring to the dandelion’s coarsely toothed leaves. Dandelion wine was popular in early European cultures, where it was often believed that fairies helped the fermentation process along, because the bitter plant “magically” turned into sweet wine. Sci-fi author Ray Bradbury wrote a book titled Dandelion Wine. 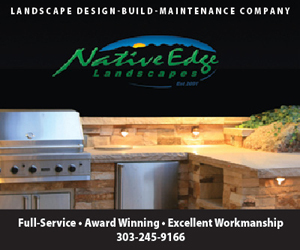 Prep Tip: If harvesting dandelions from your lawn, pick them in early spring, before the flowers appear. That’s when the leaves are at their most tender and least bitter. Cook Tip: The leaves can be steamed or sautéed, or added to soups. Toss raw dandelion greens into a salad for extra “bite,” and dress it with a balsamic-based vinaigrette. 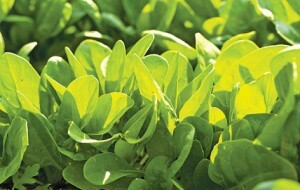 Tidbit: Chard is often referred to as Swiss chard because of its extensive cultivation in Switzerland. But it’s also known as silver beet, spinach beet, leaf beet, sea kale beet, white beet, strawberry spinach, Sicilian beet, Chilean beet and Roman kale—talk about an identity crisis! Swiss chard has a mild flavor similar to spinach. One cup of cooked chard has just 35 calories, but a surprising 315 mg of sodium. Prep Tip: Thinly slice the stalks to make them tender once cooked. 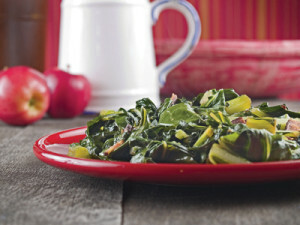 Cook Tip: A versatile green, chard works well in soups and stews (especially with leeks and shallots). Sautéed in olive oil, chard pairs well with flavors such as basil, nutmeg, oregano and, of course, fresh garlic. 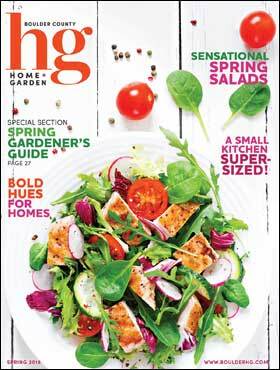 Tidbit: Sturdy and reluctant to wilt, kale is often seen lining salad bars and vegetable trays at restaurants. 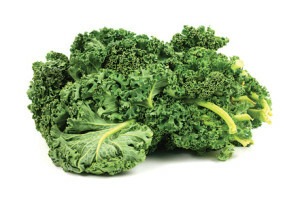 Kale is also the most easily rhymed green: ale, bail, dale, gale, jail, mail, nail, pail, rail, stale, tail, veil, wale. Prep Tip: Kale’s bold, slightly bitter flavor goes great with poultry, fish and meats, especially pork. If this green has too much crunch for you, trim off the stems and use only the leaves. Cook Tip: Caraway or fennel seeds bring out kale’s flavor, which also pairs well with fresh ginger. Try sautéing kale in olive oil with ginger, garlic, low-salt tamari, sesame seeds and a dash of rice vinegar. Tidbit: Nothing says “the South” and “soul food” quite like collard greens. Yet this green was also grown extensively by the ancient Greeks and Romans. If eaten on New Year’s Day, collard greens, which taste like a blend of cabbage and kale, are purported to ensure wealth in the coming year because their leaves resemble folded money. 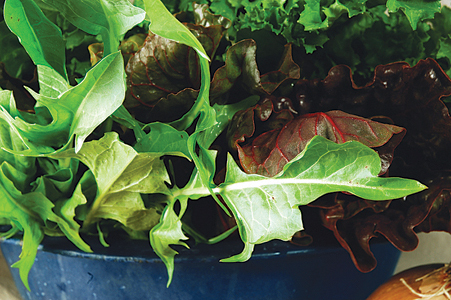 Prep Tip: The tough leaves require longer cooking than most greens. The stalks are basically inedible. Discard them, or better, compost them or use them in stock. Cook Tip: For a traditional Southern preparation, sauté onions with bacon grease. Then add some water or broth, salt, ham hocks and the greens. Cook for about an hour, until the greens are tender and juicy. Serve with your favorite hot sauce and a side of corn bread to sop up the juices. 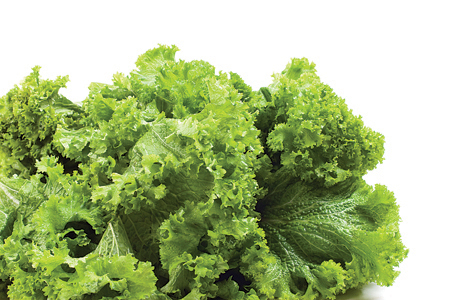 Tidbit: Mustard greens come from the same plant whose seeds are used to make Dijon mustard. Most mustard greens are emerald green, but some are dark red or deep purple. During the Italian Renaissance, recipes for mustard greens rivaled those of other vegetables, but today this green is virtually unknown in Italy. Prep Tip: Mustard greens are often paired with tougher collard greens or kale, so set them aside to add to your sauté later to allow the greens to finish cooking at the same time. Cook Tip: Their sharp, peppery flavor pairs well with sweet dressings that balance the spice, or with acidic dressings like lemon or balsamic vinaigrettes. Add diced onions and crumbled bacon to a traditional sauté of garlic and olive oil to round out this green’s flavor. Tidbit: Watercress is rapidly gaining a reputation as an anti-cancer veggie. What’s more, the small leaves of this aquatic plant are rich in iodine, making it helpful for people with underactive thyroids. 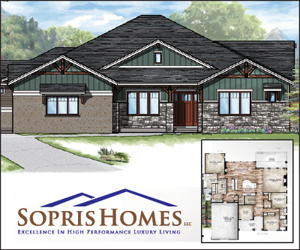 This sharp-tasting green traditionally grows along waterways and streambeds, hence its name. 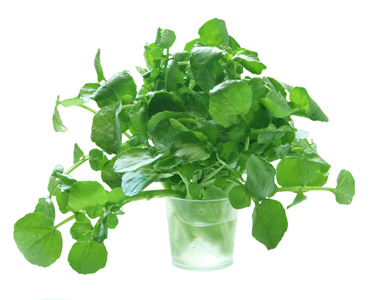 Prep Tip: Watercress is delicate and perishable, so use it as soon as possible. Cook Tip: Though it’s commonly used to top salads and sandwiches, try adding wilted, chopped watercress to mashed potatoes instead of chives to impart a peppery flavor. Tidbit: The familiar food of a certain sailor—and the nemesis of picky eaters and children everywhere—spinach is the perennial poster child for healthy foods (having weathered the negative press surrounding a 2006 E. coli outbreak traced to spinach fields in California). Although raw spinach is tasty in fresh salads, cooked spinach offers more nutritional benefits. Prep Tip: Spinach is rich in iron and calcium, but it also contains oxalic acids that can block absorption of these minerals. Pair it with a dish high in vitamin C, which aids absorption. Cook Tip: Sautéing in olive oil with garlic is the classic preparation, but try adding pine nuts, or even raisins, to give the dish a Jewish twist. Tidbit: The mildly peppery flavor of mizuna, a Japanese green, makes it popular in salads (it’s commonly found in mesclun mixes) and soups. With saw-toothed leaves and thin white stalks, mizuna is also known as spider mustard, potherb mustard and California peppergrass. 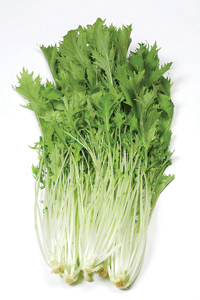 Prep Tip: If your mizuna leaves are a little limp, restore crispness by soaking them in ice water for 10 to 15 minutes. Cook Tip: To make your own mesclun mix, pair mizuna with sweet and bitter greens like baby spinach, escarole, arugula, dandelion leaves, and romaine and loose-leaf lettuces. Or make a simple mizuna salad with daikon radish (cut very thin daikon “sheets” with a vegetable peeler). Tidbit: Sometimes called Chinese cabbage or “soup spoon” because of the leaves’ shape, bok choy is an Asian green with dark-green leaves and bright-white stalks. Baby bok choy looks similar to bok choy, but has lighter green leaves. Prep Tip: The base of bok choy stalks can hold a lot of dirt, so use a vegetable brush to get them squeaky clean. 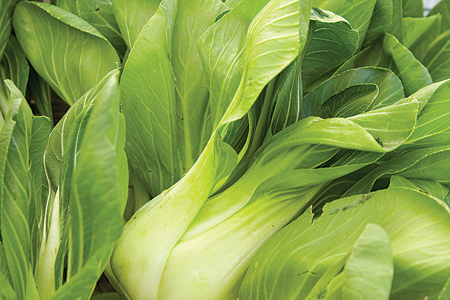 Cook Tip: Whole heads of baby bok choy are great halved and grilled, and taste slightly sweet. Mature bok choy is excellent in veggie stir-fries (add low-sodium chicken broth for extra flavor), or chopped fresh into a salad. The leaves are nutrient-rich, while the stalks provide snappy crunch. Toss chopped leaves and stalks with an Asian-style dressing made with sweet soy sauce and rice vinegar. Tidbit: Also known as broccoli rabe (or raab), rapini is actually more closely related to the turnip than to broccoli. Its pungent and sometimes bitter flavor is often considered an acquired taste. 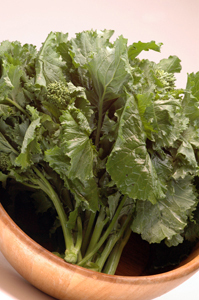 Popular in Italian cooking, rapini is a good source of potassium. Prep Tip: Blanching rapini for a minute or two in boiling salted water mellows out its aggressive flavor before you cook it. But don’t overcook; you want to retain the bright green color. Cook Tip: Try wilting rapini in chicken broth and tossing it with cooked, hot Italian sausage and al dente farfalle (bow-tie) pasta. Or make a vegetarian version with pasta, rapini, mushrooms, garlic, onion and chickpeas tossed in olive oil and topped with red pepper flakes and fresh parsley. Tidbit: A bit on the bitter side, endive is rich in folate and a variety of minerals, including manganese. True endive (Cichorium endivia) comes in two varieties—a broad-leafed version commonly known as escarole, and a curly-leafed variety commonly (and misleadingly) called chicory. Belgian endive, which is what most people think of as endive in the United States, is actually leaf chicory (Cichorium intybus), a separate species. Endive is said to contribute to good colon health. 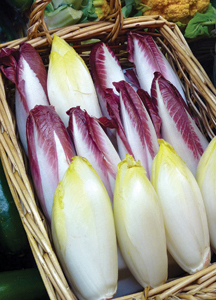 Prep Tip: The leaves of Belgian endive can be purple, yellow, white or green. Mix and match colors for a vibrant, colorful dish. Cook Tip: Belgian endive makes an excellent appetizer. Separate the broad, smooth leaves, fill them with a floret of blue-cheese mousse, and top each with a caramelized pecan. Peter Bronski (peterbronski.com) is an award-winning Boulder writer and coauthor of the cookbook Artisanal Gluten-Free Cooking.